There are explosions, talk of independence, and a villain named Mao. What more could you ask for in a Fourth of July screening? Shanghai’s most prominent gangster and his two very different mentors will choose up sides amid the turmoil of Republican era China in Wong Jing’s The Last Tycoon (trailer here) which screens today during the 2013 New York Asian Film Festival. 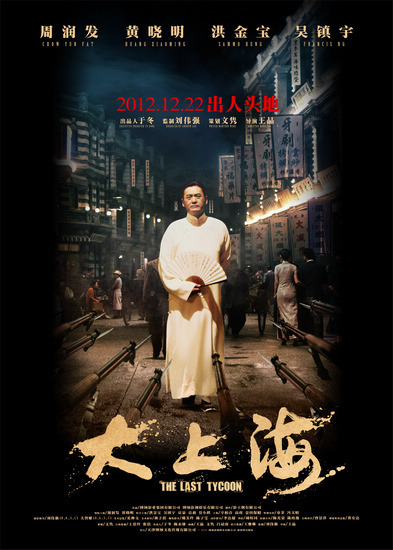 Cheng Daqi is very loosely based on the real life historical figure, Du Yuesheng, a high-ranking Shanghai mobster, who supported the Nationalists out of anti-Communist and anti-Japanese sentiments. As a young man, Cheng always intended to make a name for himself in the big city, but a scrape with a corrupt cop forced his hand. It also introduced him to his temporary cellmate, Mao Zai, an army officer serving as an unofficial liaison to the underworld. When Mao’s men spring them from prison, Cheng follows them to Shanghai. Cheng quickly raises through the ranks, apprenticing under the top gangster, Hong Shouting. However, he still remembers his great love, Ye Zhiqui. She has also fulfilled her ambition to become the toast of Beijing’s opera, eventually marrying Cheng Zhaimei, a scholar and clandestine operative in the revolutionary underground. Of all the nightclubs in Shanghai, Ye and her husband walk into Cheng Daqi’s, because it is the biggest and most ostentatious. There are echoes of Casablanca throughout Tycoon, but Wong never slavishly parallels the Bogart classic. He also departs considerably from the established facts of Du’s life. However, he clearly plays to the strengths of his star, Chow Yun-fat, giving him plenty of opportunity to blast away two-handed while dressed to the nines. Although The Assassins was pretty good, Tycoon is really the sort of film his fans have been waiting years for. Chow does his stone cold cool thing and it still works like a charm. Sammo Hung also brings all kinds of gravitas and good karma as his patriotic master, Hong. Clearly enjoying the heavy role, Francis Ng is charismatically villainous as the turncoat Mao Zai (not Zedong, but close enough for the 4th). While his Mao is not exactly analogous to Claude Rains’ Captain Renault, Monica Mok really throws a wrench in the Casablanca works as Cheng Daqi’s wife, Bao. Sensitive but strong and resilient, she rather walks away with the audience’s sympathies. Produced by special festival guest Andrew Lau, Tycoon is the sort of sprawling gangster/war epic that HK cinema does so well. It is a quality period production, boasting quite a few get-your-money’s-worth action sequences. Sure to satisfy fans of the all-star cast and martial arts shoot-outs, The Last Tycoon screens tonight (7/4) at the Walter Reade Theater, as part of the 2013 New York Asian Film Festival. Happy 4th of July.